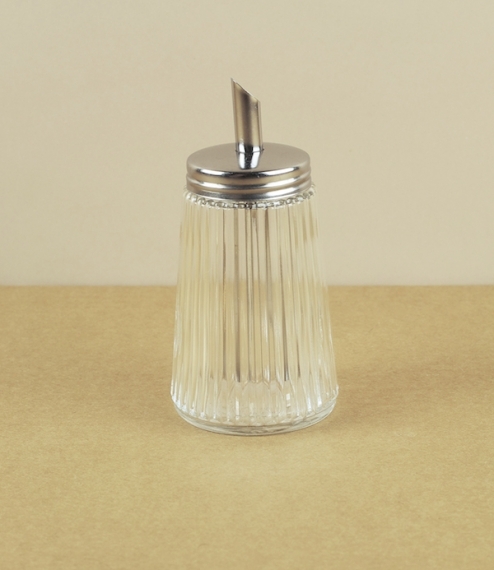 Classic chromed steel and ribbed glass sugar dispenser or portioner of a type familiar from greasy spoon cafes and dreams of American diners. Designed so that upon rapid inversion it releases a limited quantity or portion (very approximately a teaspoon) of sugar. As these have been made since the 1960s by the company of G Wolf Gmbh in the North Rhine-Westfalian city of Bielefeld they may be interpreted as evidence the place exists, or else, if that is your mindset, dismissed as yet another red herring wrapped in conspiracy. About 15cm high and 8cm in diameter.